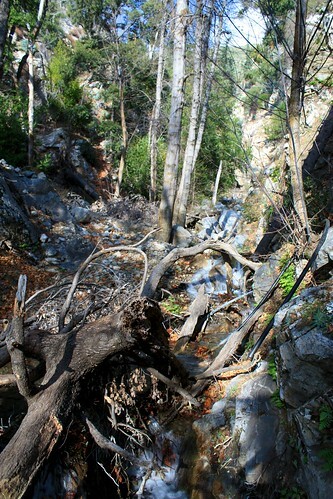 A short but potentially challenging hike to a 50 foot waterfall high in the San Gabriel Mountains in a narrow, sylvan canyon. Beautiful foliage and seclusion make this hike a memorable excursion, even though it won’t win any awards for distance. 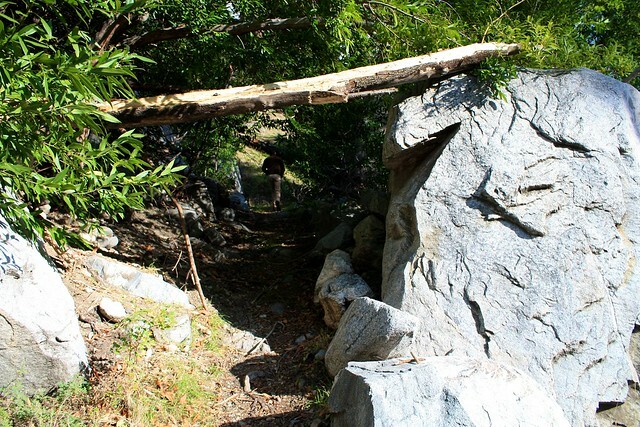 The last part of the trek is a rugged, off-trail scramble through the creek bed – waterproof boots are highly recommended. Make this part of a multi-hike trip to the Crystal Lake region. 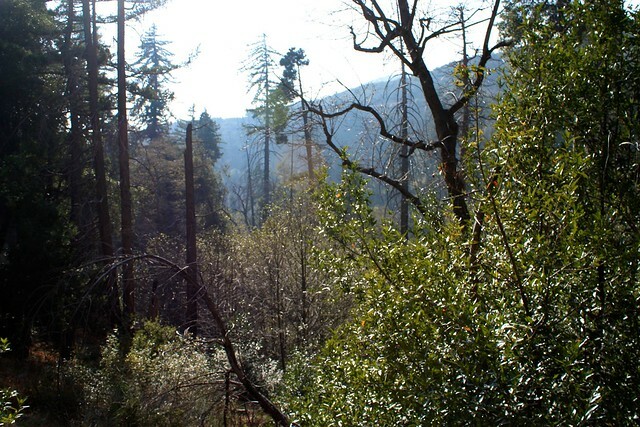 Most of the Angeles National Forest above Azusa along the CA-39 has been closed since I moved out to California, but earlier in 2011 the Forest Service re-opened the area devastated by the 2002 Curve Fire, which burned almost 21,000 acres. I hadn’t been able to make it out to the newly-reopened area until recently, but it’s definitely a place I’ll be exploring more earnestly in the future. The trail to Lewis Falls along Soldier Creek is a very short trail – one mile round trip – but this is no stroll through the woods. 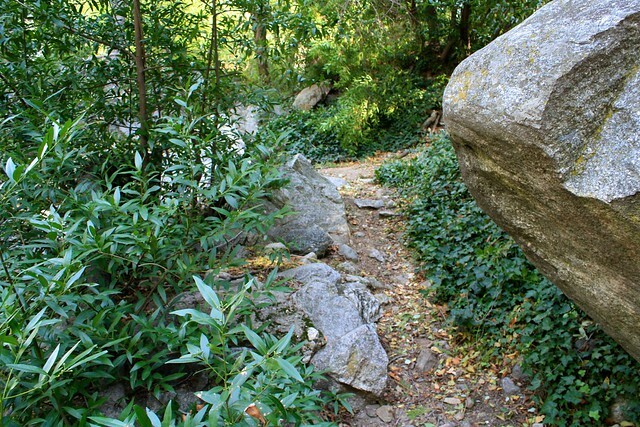 The last tenth of a mile is a completely unmaintained scramble and boulder-hop along the creek bed, and will probably take you about as much time to traverse as the first 0.4 miles. 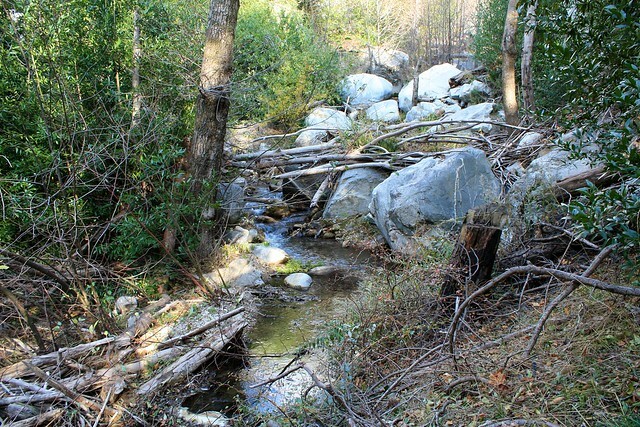 Drive up the CA-39 past the turn-off for East Fork and look for an unsigned creek crossing about 2.5 miles past Coldbrook Camp. 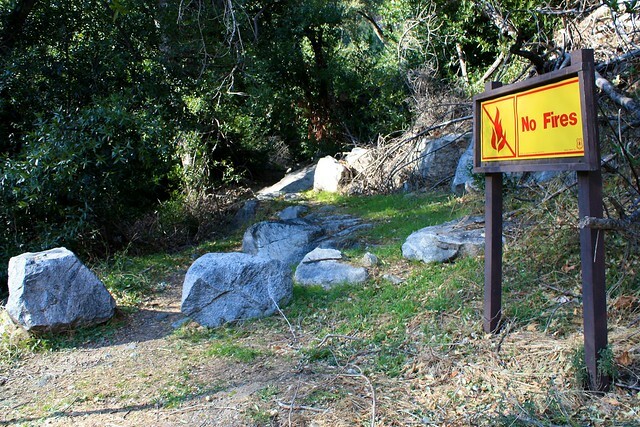 It can be easy to miss, but look for the running water and prominent ‘No Fires’ sign – this is the trailhead. While the trail is very close to the road, there still aren’t too many cars that travel this route – so you won’t notice much in the way of traffic noise. Instead, you’ll probably be surprised at how quickly the forest truly envelops you. 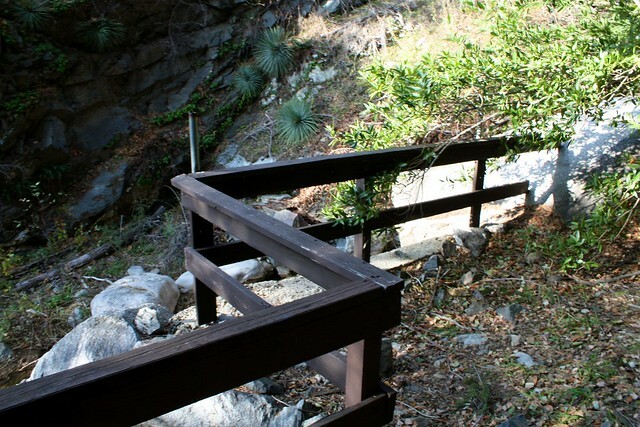 With only a few footsteps, you’ll be transported to an incredibly picturesque and secluded stream-side canyon. The Curve Fire wiped out most of the cabins that used to stand in this canyon, but there are a few that stubbornly hold on, remnants of the old Falling Springs Wilderness Resort that used to operate here. Topo maps may still have the names “Falling Springs” or “La Cienega” in the region, another name for the same getaway spot. Some remaining cabins are still leased out and others are under slow reconstruction. You’ll pass these along the way on the well-marked part of the trail. Don’t disturb the residents if they’re at home. 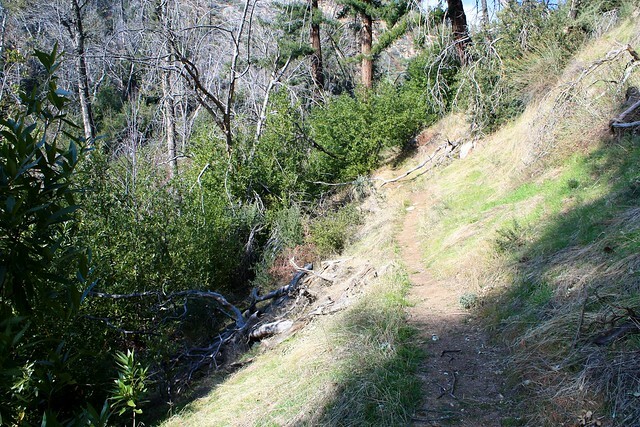 Continue on this short trail as it passes a surprising variety of terrain – from large boulders to ivy-covered trees to the ruins of some of those cabins that didn’t make it through the Curve Fire … all the while enjoying the soothing white noise from Soldier Creek, just to your left. At the ruins of one particular cabin at about the 0.4 mile mark, you will note a brown wooden fence overlooking a steep decline to the creek. The trail appears to end here. It’s not impassible, but it can be a challenge for anyone who’s not prepared for it. Just don’t be afraid to get your hands dirty or your feet wet, and get ready to exercise your sense of balance on a few log crossings along the way – but it’s actually a really fun way to finish up this trail, and it makes your arrival at Lewis Falls all the more rewarding. The canyon ends at the waterfall, so there’s no chance of you missing it. 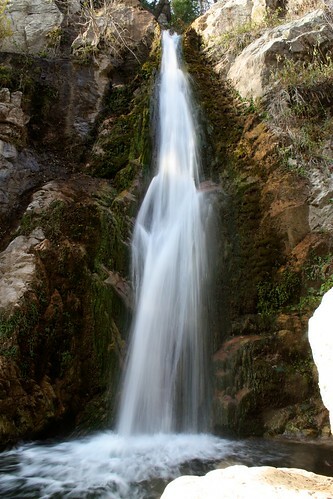 Lewis Falls is named for the longtime Forest Service ranger Anselmo Lewis, who frequently patrolled in this area. There are a few places near the falls to sit down for a spell and enjoy your beautiful surroundings. Take your time, relax, and then return back the way you came when you’ve had your fill. Rough. The trailhead is unmarked and the trail is unmaintained past a few leased cabins. Additionally, this area was re-opened to the public in 2011 after being closed for almost 6 years. The bushwhacking you'll have to do on the last tenth of a mile may require some basic scrambling skills. It's nothing inherently dangerous, but it will take you longer than you think to get through. Take CA-39 north into the Angeles National Forest north of Azusa. Continue past the turn-off to East Fork Road and note when you pass Coldbrook Camp. The unmarked trailhead will be on the north side of the road in 2.5 miles at the unmarked crossing of Soldier Creek (look for the year-round flowing stream). This can be easy to miss - if you find yourself driving past Falling Springs Resort, you've gone about 0.05 miles too far. This trail is not on the Trailbuilders' official inventory so it does not get formal maintenance. Thanks for writing in. I was actually trying to dig up some history on Falling Springs myself, and unfortunately couldn't find a ton. 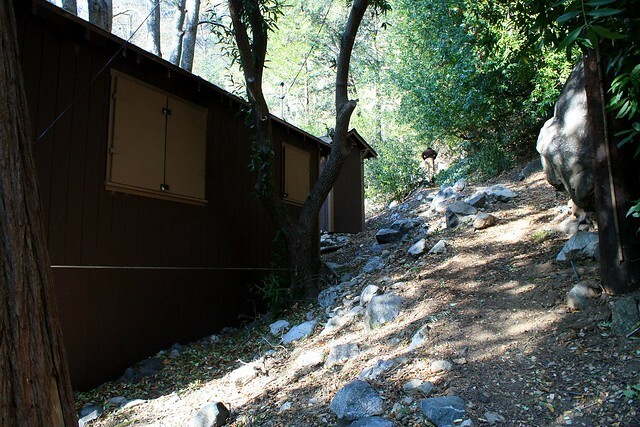 Like many wilderness resorts in the San Gabriels, I believe this one fell victim to a wildfire (maybe the 2002 Curve Fire?) and vandalism after it was mostly abandoned. If you have any photos or information from your time there in the past, I'd love to hear it! Shoot me a line at hello at mho.dev! Casey, just came across this site. I am looking for more history nad info regarding the falling springs lodge. As f family we spent many summers staying in the cabins and enjoying family times there. Went back to visit Saturday 7/9/16 was astonished it was still not there. Many, many memories. Would like to find some history. Any help? Hey Jack - I am VERY late in responding to this but I'm in the midst of some historical research that answers your question. 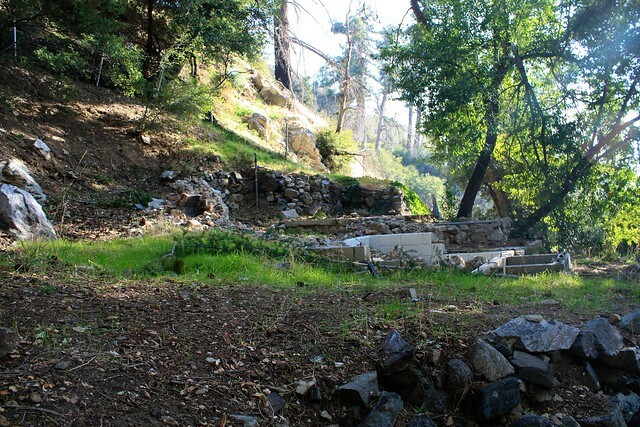 The "Falling Springs" name comes from the name of an old wilderness resort that was tucked away in the area, formerly known as La Cienega and later Headlee's (some topo maps have both the La Cienega and Falling Springs name still labeled). Falling Springs Resort was still active until the 2002 Station Fire, when most of the remaining cabins were destroyed or rendered unusable. 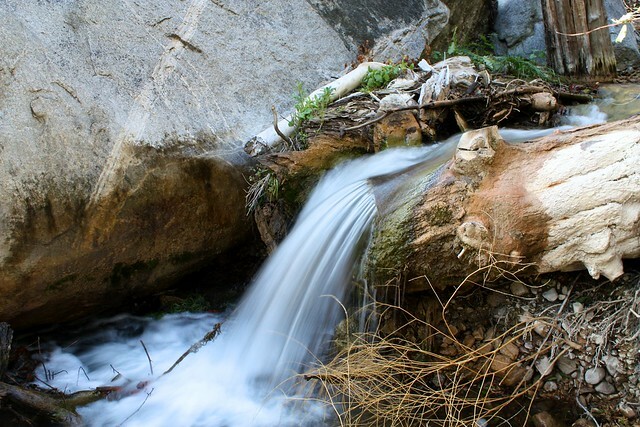 There are, however, lots of springs near the area - one that's just to the northwest of Soldier Creek and a few above the falls, along with many more further up the mountains. Just discovered and did this hike today. FUN! It's really the best description, just really fun. I got wet. I got muddy. I climbed over rocks and under trees. My dog loved it. I loved it. With the recent storm the falls looked beautiful. Again, thanks for the blog! Anyway, really enjoyed reading your blog, thank you! Hey Casey, thanks for writing about this falls location! My buddies and I went yesterday. However, we made things extremely hard for ourselves. We followed the GPS coordinates (@34.304680,-117.836566) which led us to a closed off dirt trail. So we parked and walked down this dirt road and ended up at a dead end (there was a big dirt mount). However we saw a dry up creek bed leading down to Solider Creek down below. So we ended up climbing down it. It was extremely rough, with lots of loose rocks (we also had a first time hiker with us too). I just want to put this out there because it was definitely a path not meant to be taken by those who are physically not in shape and also inexperienced hikers. However, overall, the hike was fun! It actually wasn't that hard, just took some getting used to. Seriously, it's a nice closed off falls and since we went on a Monday - there was no one else around. So thank you so much for writing about this great location! I saw both Marty and David hiking groups at the falls. Should have done what Marty did and hike another trail. This one is short but sweet. We were all very lucky that day, a large rock rolled down into the street and missed all the park cars.